Rhythm of the Dance. Photo by Wim Lanser. Traditional Irish dance and music combine in a show which is hotfooting it to Derbyshire. Featuring world champion dancers, a traditional Irish band and three Irish tenors Rhythm of the Dance has wowed audiences all over the world since 1999. 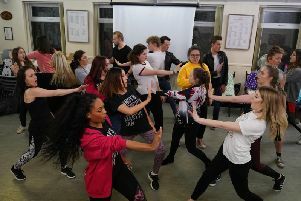 The show started life as a three-week tour in America and has continued to evolve, introducing new elements to breathe fresh air into Irish dance.